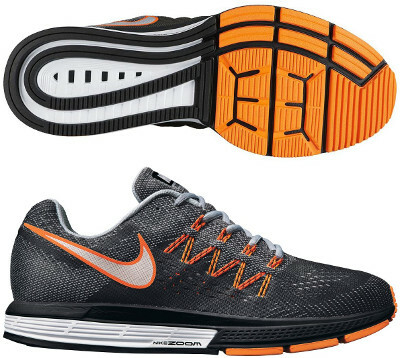 Nike Air Zoom Vomero 10 are neutral cushioned running shoes. The Nike Air Zoom Vomero 10 is the latest update of the premium cushioned shoe from Nike targeting neutral runners who enjoy long distances. The Vomero 10 takes many innovations from its relative with stability support Structure 18 to increase its market share. The Vomero 10 features a (long time expected) firmer cushioning than it predesessor the Vomero 9 through co-molded dual-density Cushlon foam in the midsole combined with decoupled Nike® Air Zoom crash pads in the heel and forefoot providing a more responsive stride. Outsole has been redesigned to increase flexibility including a lateral crash rail for smoother transition. Upper creates an adaptable fit with new seamless breathable Flymesh while Dynamic Fit technology uses Flywire cables that integrate with the laces wrapping around midfoot to provide lockdown and stability through footstrike.